Rescuers are working against the clock to try to find more than 600 people still missing after heavy flooding in north-east Brazil. 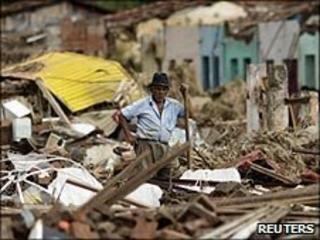 At least 44 people have died and 120,000 made homeless after a week of rain in Alagoas and Pernambuco states. Whole villages have been swept away, with witnesses saying that churches, schools, hospitals and even a train station have simply disappeared. Easing rains have allowed rescuers to reach areas previously cut off. Soldiers have been using boats, planes and helicopters to get aid to the worst-affected areas. Damaged railway tracks and roads have hampered the aid effort. The federal government says it is allocating R$100m ($56m) to the relief effort. Many residents say the floods have washed away their homes and livelihoods. "This was my life, I do not have anything else," Eduardo Almeida, who lost his home, small store and restaurant in Rio Largo, Alagoas, told the AFP. Some complain that they have so far received little outside help. BBC News website user Katya Christina, of Maceio, Alagoas, said she had heard that people in the countryside were getting no government assistance. "My friend lives in the town of Sao Jose Da Lage, which has been devastated," she said. "He says the government is doing nothing to help. The locals are having to help each other. We are trying to get food and blankets sent out to help people. Anything we can do to help." Officials say that the death toll in Alagoas has held steady at 29, but the number of confirmed deaths in Pernambuco has risen to at least 15. The Civil Defense Department estimates that some 600 people remain unaccounted for. Alagoas governor Teotonio Vilela Filho on Tuesday had put that figure at 1,000, saying: "We are worried because bodies are starting to appear on the beaches and the rivers." The BBC's Paulo Cabral in Maceio says all 50 residents from the remote village of Muquem, missing since floodwaters last Friday destroyed their community, were found on Wednesday. They had survived by seeking shelter in the only safe place available in the area - two big trees - our correspondent reports. Are you in Brazil? Are you affected by the floods? Send us your comments using the form below.